At NC State University, 277 students recently became scientists as part of the course Environmental Science 100: Introduction to Environmental Science. 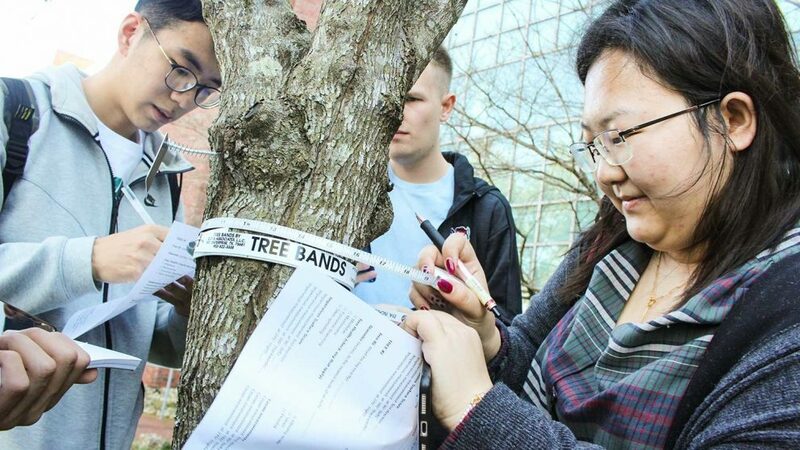 In January, student teams collected data about trees on NC State’s campus. They measured tree size, evaluated tree health and determined the amount of impervious surface challenging future tree growth. All this information will be processed and compiled for NC State Grounds Services, which manages and maintains campus trees. Jeffries first involved students in campus tree measurement last year. This year, she received two grants to enhance the project. A grant from DELTA provided technical expertise from DELTA staff members David Tredwell and Cathi Dunnagan, who developed the instructional and data collection materials for the project. A second grant from the NC State Sustainability Fund purchased tree tags, tools and equipment. Two CNR students identified and tagged 100 trees with QR codes. Once the citizen science portion of the project is completed, anyone interested will be able to scan the QR code with a phone and input data about the tree. Among the questions the project seeks to answer are: how does impervious surface affect the health and growth of urban trees? Do some tree species do better than others in these environments? How much is growth affected by impervious surface? “Too much impervious surface can trap heat, restrict root growth, and not allow trees to get the water and nutrients they need,” Jeffries said. This project also contributed to NC State’s recent recognition as a Tree Campus USA. The national certification requires that campus forests be utilized for service learning.